What a screen the Samsung Galaxy S6 edge has, huh? Its sloping sides give the smartphone a beautiful liquid look, while the super-high 1440x2560 resolution makes it possible to read the tiniest of characters and watch high-resolution video pixel-for-pixel. It would be a shame if its durable Gorilla Glass 4 covering was to face the ground, or another firm obstacle at the exact velocity to break into shards and send you on an expensive screen replacement trip! That's why you should get yourself sorted with an affordable, impact-resistant screen protector, which will - in the worst case - absorb all the impact damage before it reaches to the display, or - in the best case- keep your screen in mint condition. Right now, it's a bit early for accessory makers to come up with those great tempered glass screen protectors. In fact, we believe TPU-based protectors will be in charge of the show here, as bending tempered glass to just the right degree to cover up the S6 edge's sides will be quite a challenge for manufacturers. -Protects your screen from scratches, dust, daily wear and tear. -Accurately designed to perfectly align and fit your Device Screen. -Backed by 100% Hassle-free Lifetime Replacement Warranty program. -Easy to install, bubble-Free Application. -High Definition Transparency Film ensures maximum resolution. -Made of multi-Layer premium film with self-adhering surface. -Precise laser cut tempered glass made with polished, rounded edges. -Specially designed shock-damping layer provides impact protection. -99.99% HD Clarity and Touchscreen Accuracy. 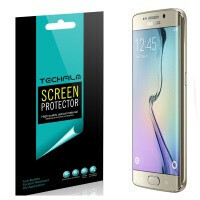 -Package Includes: 1 x Screen Protector, Microfiber Cloth, Dust Removal Clip Board. -Made of high-definition transparency film that ensures maximum resolution. -Real Touch Sensitivity for a natural feel and flawless touch screen accuracy. -Uses 100% bubble-free adhesives for easy installation without residue. -Made of 0.18mm Slim Urethane special film. How does the tempered glass one cover the edges? I wonder how the sceen protectors with play-out with the curved edges to the official samsung cases...Might need to be EXTRA precise this time. Gimmicky. I can see a lot of cracked screens from Edge owners...you drop it on its side and you could end up with a completely smashed screen here. Not only that but prices for this type of screen replacement are going to be through the roof. Just only few companies will be able to offer Tempered glass edge to edge screen protector for Galaxy S6 edge. It is for sale on Amazon under this description. Amzer Kristal Tempered Glass HD Edge-2-Edge Clear Screen Protector for Samsung Galaxy S6 Edge SM-G925F - Retail Packaging I hope this can help you. Bought a lot of cases but to find they turned yellow easy. Got a transparent case from EasyAcc, they really do good in these mobile accessories. Here is their summer celebration, google EasyAcc you will find more deals than Amazon Prime Day. Bought a lot of cases but to find they turned yellow easy. Got a transparent case from EasyAcc, they really do well in these mobile accessories. Here is their summer celebration, google EasyAcc you will find more deals than Amazon Prime Day. for a curved screen s6 edge, must need a curved glass to fully cover the whole screen. this kind of glass have color optional, and artwork optional. tested the fomax glass, can really help.